The menu focuses on traditional Italian flavors, and the asparagus and eggs ($10) is a straightforward presentation of the simple Milanese classic. Three sautéed spears of asparagus are topped with a pair of sunny side up eggs and a generous grating of Parmigiano cheese. Uncomplicated, yet rich and satisfying, I must say that three spears of asparagus feels a touch chintzy for the price. When it arrived, the ratatouille-like roasted vegetable salad was a little cooler than room temperature which allowed the full spectrum of flavors to come through. Rich and oily, with skin-on eggplant, celery and olives, along with the requisite capers, the dish is once again precisely as it should be. Served with two pieces of toast, the sprinkling of celery leaves on top add a fresh contrast to the homey, slow-cooked flavors. 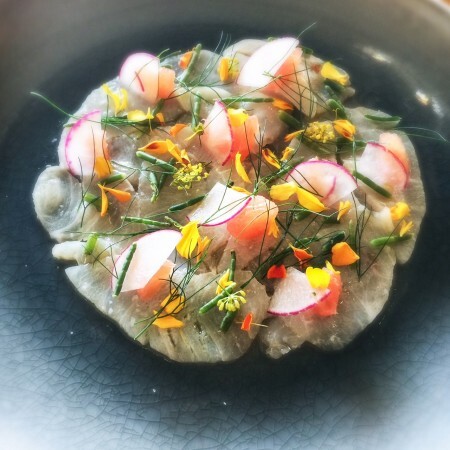 At first glance, the cobia crudo ($13) looks downright pretentious. Dotted with sea beans, radish slices, and bits of grapefruit, you get the drift. Consider the fennel flowers, not to mention the strategically placed yellow and orange chrysanthemum petals, and the disappearing wait staff starts to make sense. Maybe they’re just back there artistically embellishing slices of raw fish with tweezers? Regardless of the whos and hows, this is a delicate, floral dish that’s refreshing in both approach and flavor, as well as total Instagram fodder. 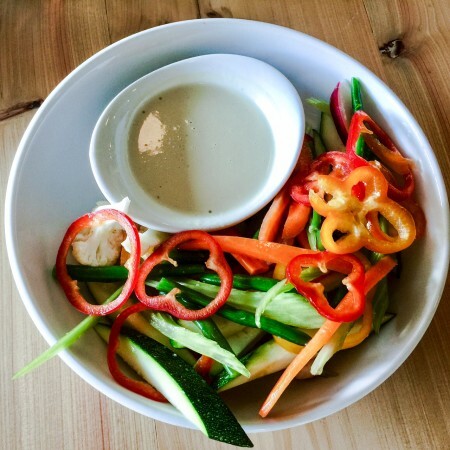 When I saw raw vegetables and bagna cauda ($11) at the top of the dinner menu, my heart did a backflip. A Christmas Eve staple memorably served to me by Roman friends, this decadent butter/olive oil/anchovy dipping sauce is a rare treat. The warm, luxuriant concoction literally means “hot bath” in Italian and is typically served with crusty bread and crudités. In the Juliet interpretation, raw vegetables were the only recognizable feature of my former culinary flame. The hot bath is cold, creamy, and even a bit frothy, with a mild anchovy and lemony profile somehow reminiscent of tahini sauce. Quite drippy and surrounded by a cut-just-a-little-too-tiny rainbow of bell peppers, celery, and green beans, as well as zucchini, cauliflower, and carrots, you can’t bait and switch me like this, Juliet. My butter and olive oil-soaked heart just can’t take it. Sure, my dining companions found the summery dish perfectly pleasing, but I had a hard time recovering from the Shakespearean level of betrayal. I propose a name change to bagna freddo. And please call me when the butter and olive oil is back in town.Consider this a warning. One thing that does not lack heat is Juliet itself. Inside, temperatures at dinner can approach sweat lodge levels. When the crowd level increases, so does the mercury. Get up and stretch a little, and it just may qualify as taking a bikram yoga class. 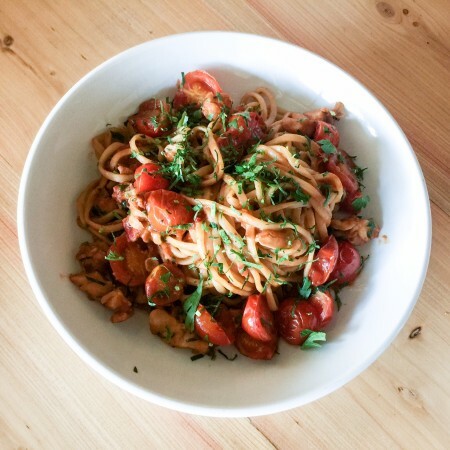 Meanwhile, the linguine with lobster and wine sauce ($23) also brings some unexpected heat. The inexplicably spicy sauce is inexplicably in a red sauce, yet briny and seafood-forward in flavor. Tough chunks of lobster mingle with a chiffonade of basil and halved, skin-on cherry tomatoes… Then finish harsh with a fiery burning in the back of your throat. Sadly, this one misses the lobster boat. On that note, although stridently traditional, the linguine alla carbonara ($14) is a yawn. 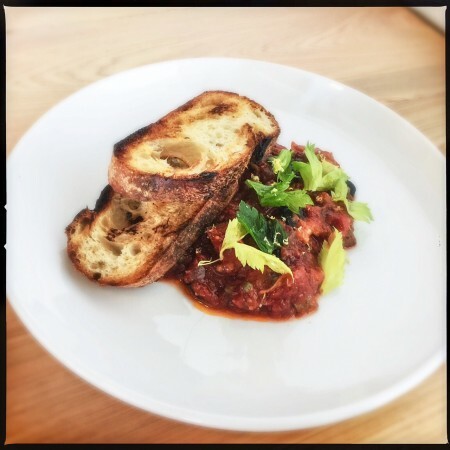 Although no one’s fault per se — the dish translates to “coal miner’s style” and, at its best, is homey and simple — it’s hard not to wish the same off-the-script liberties taken with the bagna cauda were applied here. Get out the tweezers. Some of the celery leaves — heck, some of those pungent flower petals — would help brighten both the looks and flavor of such a classically heavy dish. 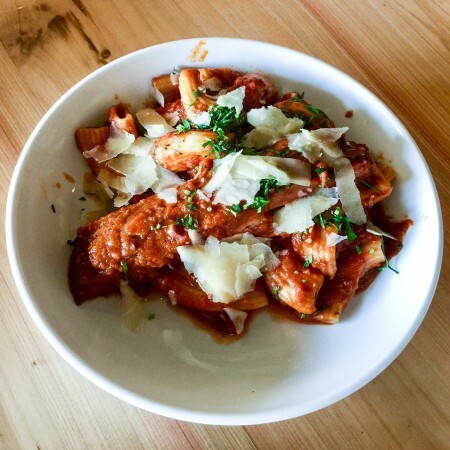 In contrast, the rigatoni with braised pork rib ($16) is folksy and welcoming. The large, toothy tubes of pasta couple perfectly with the tender, bone-in meat. Once again, there’s a little bit of a spicy finish, but it makes more sense here. Considering my recent passion for cinnamon in red sauce, perhaps I’ll smuggle in my own shaker. Hold. The. Phone. That pizza tho. 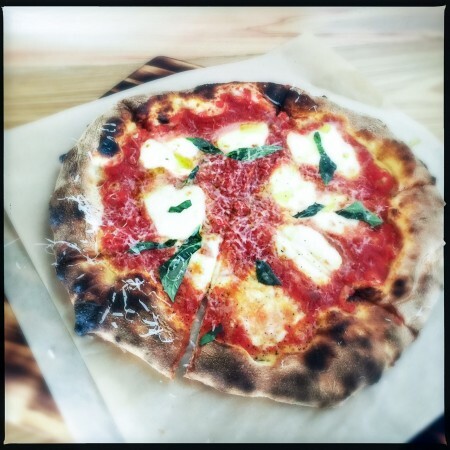 The margherita pizza ($11) is the gold standard for purists, and this one is worthy of a gold medal. Truly, impeccably perfect, you may not crave raw fish with flowers on it, but you need this pizza in your life. And in your belly. The crust is flavorful with a nice char and great chew, while the slightly salty sauce boasts chunks of fresh cherry tomato. Top that with fresh mozzarella and slivers of basil, and there are no more words required in this sentence. Similarly, the prosciutto and arugula pizza ($17) is eccellente. The same toothy crust is garnished with tomato sauce, thin-cut prosciutto, and sprightly, fresh arugula. Adorned with large dollops of creamy, luscious burrata, it’s at once light and green, yet indulgent. Despite a few clunky dishes and the desperate need for some ceiling fans, it’s worth changing into some breathable fabric and making a beeline to Juliet. The truly outstanding pizza’s bounty is as boundless as the sea, as one W. Shakespeare once said, give me my sin again.